Everyone’s their own music expert. Some know more and some know less, but I challenge anyone to have listened to the entire catalogue of the UK charts. It stops being fun after a while. That’s why at Last.fm we’ve programmed our computers to listen to music. 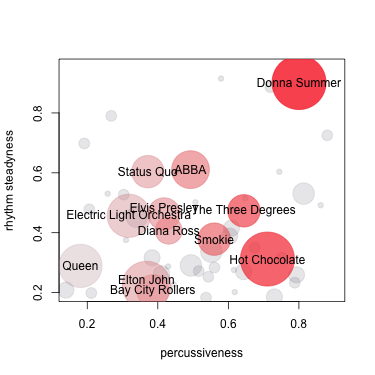 The explosion of percussiveness is one of the most distinctive patterns we have observed in our audio data. 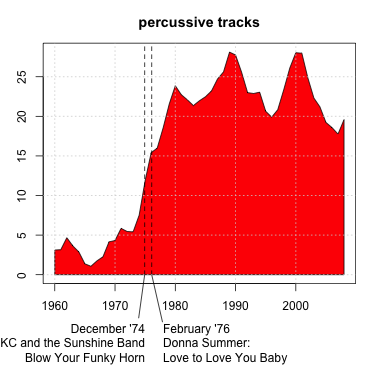 In the figure below we’ve plotted the proportion of “percussive” tracks in the UK charts over time. In order to decide how percussive a track is, we use our audio analysis framework to read the MP3 file and create a series of graphs known as spectrograms. In a spectrogram, vertical patterns indicate percussive elements, and the strength of these patterns, averaged over a whole track, is a good measure of its percussiveness. What you see in the figure are the top 20% percussive tracks of all 15,000 tracks, and how much of the charts in a particular year they occupy. We were surprised to find such a huge leap around 1974 – so what happened to make the charts go percussive? Now there’s not only Disco in those tracks but also some reggae, not least because Eric Clapton went reggae. We’ll have to look beyond percussiveness in order to find out more about Disco. So can we find out what’s really Disco? For the sake of the argument, let’s say that Disco is 70s music that’s percussive and has a steady rhythm. As it happens we have a measure for “steady rhythm”, calculated using our new measure of rhythmic change (see Audio Flowers). We calculate it this way: “rhythm steadiness” = 1 – “rhythmic change”. In the figure below, we have plotted the values of percussiveness against this “rhythm steadiness”. This time it’s not about individual songs, but about artists. The position of each circle shows the average percussiveness and steadiness of all the artists’ tracks (1974-1979), while the sizes of the circles indicate how many hits they had. We’ve added artist names for those who had more than 8 hits. One does get a feeling that Donna Summer is somehow special. Among all artists with more than 8 hits, her tracks are by far the most percussive and rhythmically steady… she’s so Disco! ABBA have a softer touch of Disco, much less percussive, but often quite steady, whereas Elton John is revealed as seriously non-disco – despite his (rather late) 1979 attempt to cash in on the craze with Victim of Love. But Elton and co had already had their share of the cake – there’s so much more to the 70s than Disco! Check back next week for “Clash of Attitudes” (edit: find it here), the second part of our Anatomy of the UK Charts. Charts: the official UK charts; the independently-maintained Chart Stats. Music Information Retrieval: technical paper on audio analysis of rhythm; Last.fm’s Audio Flowers (for rhythm steadiness/change); general introduction to content-based Music Information Retrieval. This thing that you are doing is awesome! Ace! Will the data be published Creative Commons? Am I right in thinking that percussiveness is detected because the drums stand out in the sound, as opposed to say Status Quo where essentially the same beat is drowned in ongoing guitar sounds? Hi IanAR: That’s a good idea! We don’t know whether the data is going to be Creative Commons just yet. We are currently talking about ways we can expose the data, but that’s going to be a while, I’m afraid. Hi Martijn. Yes, I agree with your observation: it’s how far the percussive elements stand out from the rest. Whether or not it’s Status Quo’s guitars that “drown” the drums I haven’t been able to find out yet. in the percussiveness/rhythm steadiness plot? thanks. This was really interesting reading Matt. I never would have thought Donna Summer. How surprising! Hi HodgeStar, yes it would be great to just be able to get ad hoc stats about any track, including Augustus Pablo’s. That’s still quite a laborious process for now, but we’re working on making it easier in the future! (also see my reply to IanAR).